Welcome to the wonderful world of the Circus of the Moon as it crosses the Atlantic to perform in the New World! Your guide? Clever Violette Vermeer, daughter of the stuntwoman and the insect trainer. 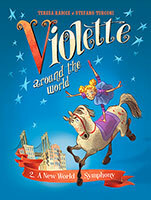 This little girl with a big heart meets two people when she arrives in America--Hiawatha, a young Native American girl, and the famous composer Antonin Dvor k. These two new friends will help her achieve a long-held dream in this second volume of Violette's adventures around the world!Welcome to the wonderful world of the Circus of the Moon as it crosses the Atlantic to perform in the New World! Your guide? Clever Violette Vermeer, daughter of the stuntwoman and the insect trainer. This little girl with a big heart meets two people when she arrives in America--Hiawatha, a young Native American girl, and the famous composer Antonin Dvor k. These two new friends will help her achieve a long-held dream in this second volume of Violette's adventures around the world! Teresa Radice (scriptwriter, b 1975) and Stefano Turconi (artist, b 1974), collaborated for the first time in 2003 and their partnership, not only artistic, has continued ever since. They have worked on Topolino (Mickey Mouse), W.i.t.c.h., and X-Mickey for Disney, in addition to Wondercity, Fairies, and many other stories. They organize creative writing and drawing workshops at primary and secondary schools, where they love debating about the creative process with young readers. Turconi has also illustrated the Agatha- Girl of Mystery series for Penguin Random House.